CHICAGO (WLS) -- Perdue Foods is recalling about 4,500 pounds of chicken nuggets that could be contaminated with pieces of plastic. 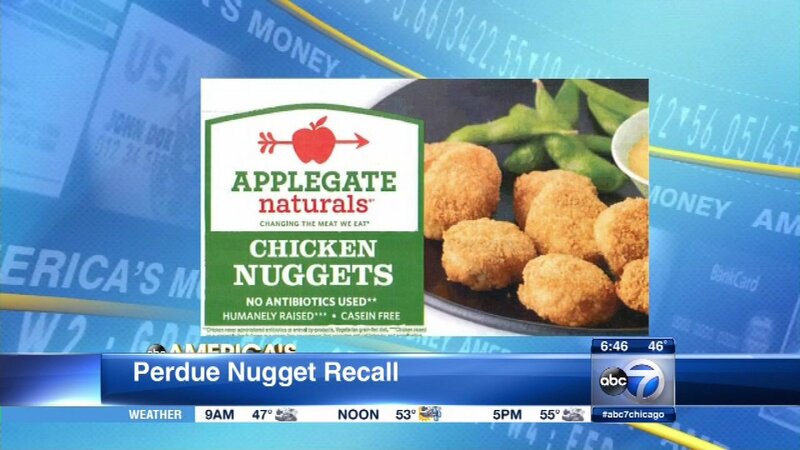 The United States Department of Agriculture announced the recall, which involves Applegate Naturals Chicken Nuggets produced on Sept. 28, 2015. The packages are marked with a "best before date" of Sept. 27, 2016. The nuggets were shipped to distribution centers in Indiana, Florida, Georgia, Massachusetts, Pennsylvania, New York and Texas. The USDA said it received complaints about "small, solid, clear plastic" inside the products. There are no confirmed reports of anyone getting sick, but the USDA said consumers should dispose of the chicken nuggets or return them to the store.